Origin and Habitat: Robertson to Riversdale, Western Cape, South Africa. Extent of occurrence 1400 km², in about 10 known locations. Habitat and Ecology: Renosterveld on shale. Agriculture is a severe past and ongoing threat as the species is lost to wheat, vines, deciduous fruits, pasture and olive farming. Livestock farming (such as ostrich and horse) in the Bonnievale and Robertson areas are also a threat. Duvalia elegans var. seminuda N.E.Br. Description: Duvalia elegans, the "elegant duvalia," differs from the other species by its heavy coat of long purple hairs on the flat and seldom reflexed corolla tips; sometimes in var. seminuda N.E. Br. these are glabrous in the apical region. The flowers open two or three together from the base of the stems. 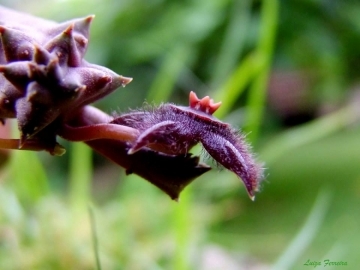 They are up to 2 cm across, purplish brown to dark purple with a rufescent pentagonal bottom. D. elegans is the type species of the genus. Stems: Decumbent and ascending, sometimes descending under the ground, ovoid to cylindrical, 18-45(-60) mm long, 8-12(-18) mm thick, oblong, with 4–5 obtuse tuberculate-denticulate angles, glabrous, dull green or purplish-tinted. Leaves: Rudiments 1-1.5 mm stipular glands minute, rarely absent. Flowers: 2–3 together near the base of the stems procumbent, with foetid odour, developing successively. Pedicels 10-25 mm long, glabrous. Sepals 2-3 mm long, 1 mm wide, lanceolate, acute, glabrous. Corolla 12-22 mm in diameter, rather flat, very dark purple-brown, shining, pilose all over the inner face with rather long soft purple hairs 2-3 mm long, glabrous on the back. Hairs simple, 1-3 mm long, purple more or less curved. Corolla-lobes 5-10 mm long, 3-6 mm broad at the base, ovate or deltoid-ovate, acute or shortly acuminate, flattish at the basal part, slightly replicate towards the apex. Annulus not very evident, scarcely raised above the level of the fold of the lobes circular, 6 - 8 mm in diameter, 0.8-1.5 mm high, pubescen. Outer corona reddish-brown to purple, disc 5-7 mm in diameter, almost covering the annulus, nearly circular, obscurely pentagonal or rarely shortly 5-lobed, nearly flat, dark red-brown. Inner corona-lobes pale brownish-yellow 1.2 - 1.8 x 1.2 - 1.6 mm. Pollinia 0.28 - 0.34 x 0.2 mm. Fruits: Seed pods (follicles), usually appearing as twin horns up to a year after flowering, 8- 13 cm, fusiform, terete, apically acute, but not beaked, wingless, smooth, decorative. Seeds: 5 x 3 mm. 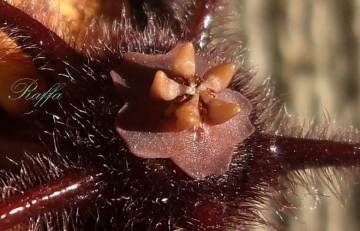 6) Ulrich Meve, Focke Albers “The species concept in Duvalia (Asclepiadaceae): A preliminary revision of the genus” In: Mitteilungen aus dem Institut für Allgemeine Botanik in Hamburg. 23: 595–604.1990. 8) Bruyns, P. V. 2005. 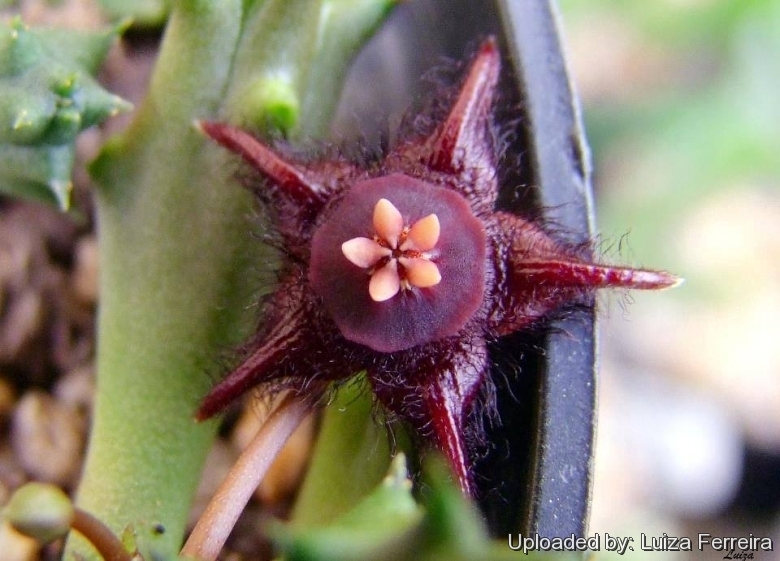 "Stapeliads of Southern Africa and Madagascar", vol. 1: 68-81. 9) Meve, U. 1997. "The genus Duvalia (Stapelieae)", 130 pp, Springer, Wien. 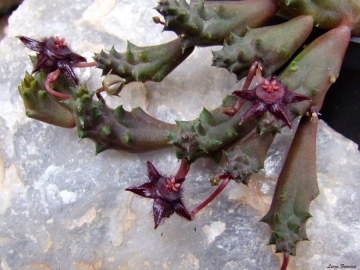 Cultivation and Propagation: Duvalia alegans is an easy obliging blooming plant when mature, that it is happy in any average succulent house. Potting:Since roots are quite shallow, use a soft and incoherent cactus mix or add extra perlite or pumice to regular soil potting soil, and clay pots help the plants to dry out between watering.